What’s a Memphis construction project without a shout-out to Elvis Week? We first set foot in Memphis during Elvis Week 2002. We pulled up a U-haul to the corner of Main and Madison. As we began to unload, an Elvis walked by. We giggled. How very Memphis. Then another Elvis walked by. And another. At this point, we exchanged glances: what exactly had we gotten ourselves into? Several days later, we were told about Elvis Week. Fast-forward to 2017. We’re back on the corner of Main and Madison, showing our children where Mom and Dad lived when they first were engaged. “Did you know Elvis?” the little one asks with a sparkling smile. No, honey, but we sure do like him. Put on your blue suede shoes this year: there’s still time! Check out this blog and this schedule. Oh, and this article profiling some dedicated Elvis impersonators. 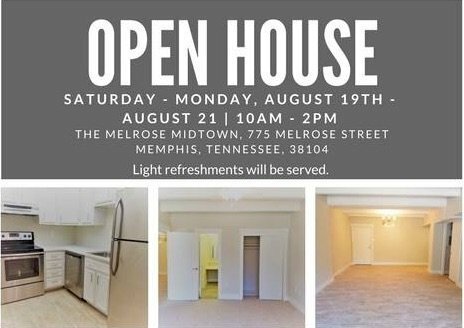 And while you’re out and about, join us starting 10:00 tomorrow (that’s Saturday, August 19) at The Melrose Midtown, 775 Melrose Avenue, where Leasing Angels, Inc. is hosting a 3-day open house with some sweet new tenant incentives.